Philosophy in Action: NoodleFood : Progress! While there’s been progress in popular attitudes, there’s been regression too. Back in 1967, lawmakers were apparently willing to set aside their personal prejudice because they were persuaded by an argument that denying marriage to willing partners was unjust. 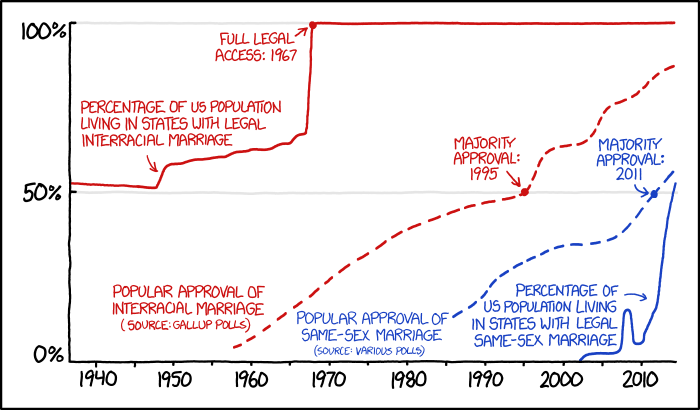 Today, the law almost perfectly tracks the personal prejudice of the majority. If that’s right, then principled lawmaking and prejudice have declined simultaneously– so the glass was half full then, and it’s half full now. New Policy Paper on the “Personhood” Movement Progress of Black America?